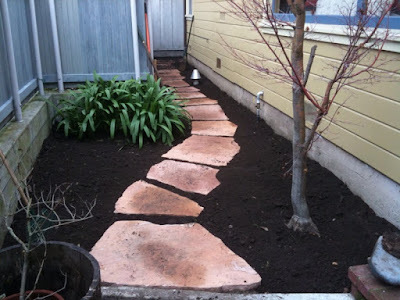 This work in progress in Elmwood is to create a flagstone path walkway around the house leading to an existing patio in the back. Here you can see that a small retaining wall was added to support the higher grade of existing trees and shrubs. The path and soil grade against the house had to be lowered in order to avoid soil build up directly on the house. 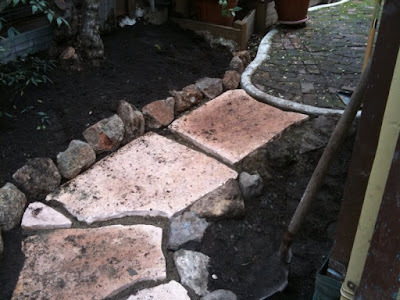 Additional retaining stones were added on the lower side of the path to help prevent erosion. Because drainage is a known issue at this location, we want to prevent any seepage against the house. 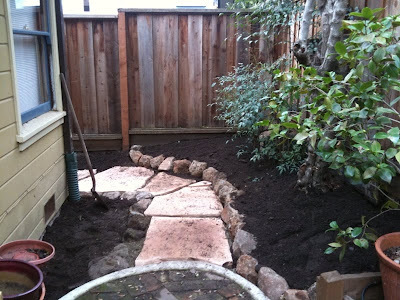 We added 4 inches of drainage rock beneath the walkway, set the stones in sand (as opposed to decomposed granite) to further enable quick drainage from heavy rains and potential run off from the slope of the established planting area and channeled downspout drains away from the house. The completed landscape will have plantings to complement the house, existing plants and small space on either side of the path. Check back later to see an update to this project.